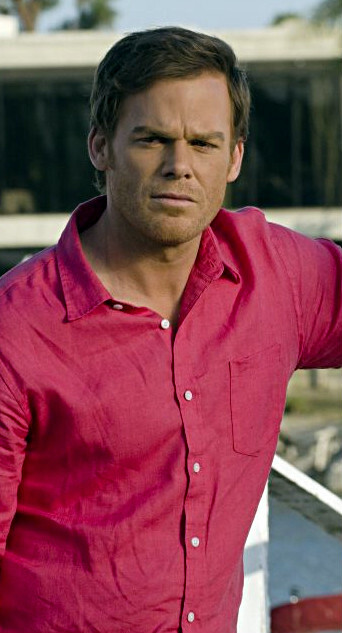 Dexter Daily: Michael C. Hall: "I Wouldn't Rule Out the Possibility of Doing a TV Show Again In the Future"
Michael C. Hall: "I Wouldn't Rule Out the Possibility of Doing a TV Show Again In the Future"
via HitFix: Dexter is only a few episodes from coming to an end and Michael C. Hall revealed to HitFix that he isn't really paying attention to how the final season is being received. After eight years of playing the anti-hero serial killer Hall admits he needs a break. "I am not watching it as it airs," Hall says. "I'm sort of, y'know, interested in putting some space between myself and that huge experience just for my own peace of mind. But it is kind of strange to have finished it and to simultaneously have the awareness that people are going through the end as viewers right now." "You know, I would never say never, or I have said 'never.' Right after 'Six Feet Under' I said never and then I did 'Dexter' for eight years. So, I've learned to never say never," Hall says. "I don't want to forsake any opportunities that might emerge on the television front. Though my appetite at this point is to commit to things that have a bit more of a finite schedule calendar wise. Making another open ended commitment to a character is something I don't know that it would be wise for me at this point. So yeah, I'm interested in doing more films, getting onstage again perhaps." Read the rest of the article, after the jump. Hall continues, "But I wouldn't rule out the possibility of doing a television show again at some point in the future. I mean, as we know a lot of great things are made." At the moment, Hall is supporting "Darlings" which premiered to positive reviews at the 2013 Sundance Film Festival in January. The beatknik period drama centers on the true story of a love triangle between a young Allen Ginsberg (Daniel Radcliffe), Lucien Carr (Dane DeHaan) and David Kammerer (Hall) that came to a gruesome end. John Krokidas' directorial debut also features Ben Foster as William Burroughs and Jack Huston as Jack Keroac. Hall gets one of the film's juicier roles as he gets to have some fun with Kammerer's manipulation of Carr and his intense jealousy of Ginsberg. The picture, however, pulled off a few production miracles in 23 or so days of shooting including one scene that found the SAG Award and Golden Globe winner floating in a very chilly Hudson River in the middle of the night. It's not something Hall is likely to forget anytime soon. "That water was pretty cold and very murky," Hall recalls. "And I think there were moments where both Dane and I were like 'Why aren't we shooting this in a tank? You got the cameras five feet away from us. What are we doing here?' [Laughs.] But it was actually kind of fantastic. I actually have a photo of Dane and me in this makeshift plastic hot tub that they put us in between takes. We would go and just sit in this hot water. So there were times it felt like this really sort of like extreme spa treatment. When we get out of the water and they would pour buckets of warm water over our heads." Unlike Radcliffe, Foster or Huston, Hall didn't have a lot of reference material to dig into about his character. What little he found, however, was extremely helpful. "There's one photo and I actually came across and was sent an image of a painting that was done of Kammerer from the time, which was actually very useful just in terms of the way he was portrayed, the way he was sitting," Halls says. "There was something kind of arch about him [and I had the] instinct that he probably had an arch persona. But yeah, he sort of a footnote in the accounts of the early beat origins. And I like that this film inspired to paint him as vividly as it did all these other characters." The paint, of course, is Hall who has made a career of bringing vivid portrayals to television, film and the stage. And the Great White Way appears to be his next destination. Hall would not announce the name of the production, but he's planning on appearing in a new play this Spring on Broadway.